There have been numerous studies over the years looking into how London should develop and that detail a vision and proposals for the future that are frequently very different to the past. Many of these proposals get no further than the written page, however it is fascinating to see how London could have developed into a very different city if some of these proposals had been implemented. In the early 1970s, East London and the London Docklands were suffering from the closure of the docks, loss of industry and employment and the gradual exodus of people. The area had also never fully recovered from the significant damage of wartime bombing. My posts on the 1973 Architects Journal issue covering East London have explored some of the original issues, and these can also be found in a strategic plan published in 1976 by the Docklands Joint Committee. I found the 1976 publication documenting the strategic plan in a second-hand bookshop, having been originally from the Planning Resources Centre of Oxford Brookes University. 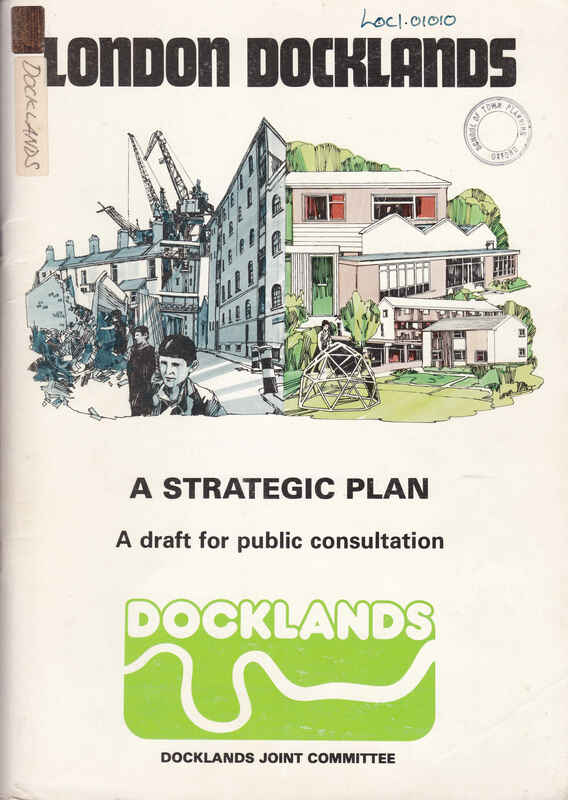 The front cover provides an indication of the type of change proposed for the London Docklands, from derelict docks and industrial buildings to housing and schools more likely to be found in the suburbs, rather than East London. 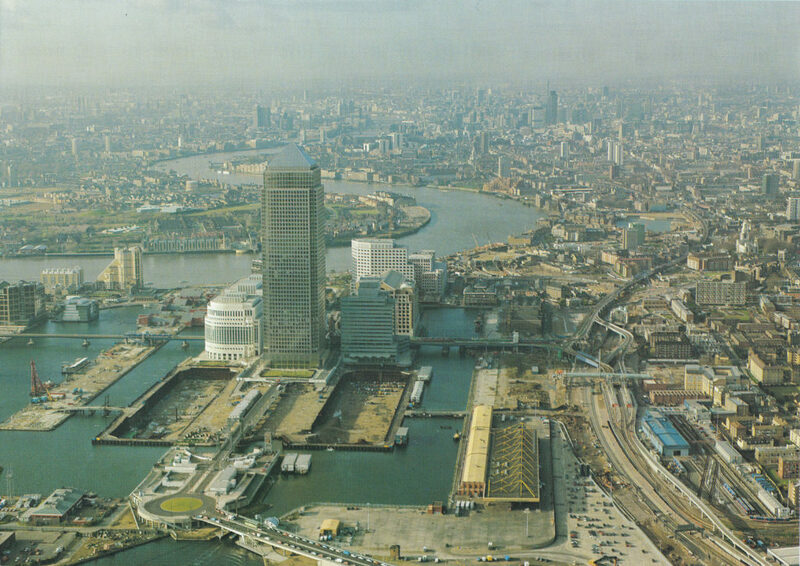 The 1970s were a decade of confusion in the development of the London Docklands. Dock closure had started in 1967 and continued through to 1970 with the closure of the East India, St. Katherine’s, Surrey and London Docks. Although the West India and Millwall Docks would not close until the end of the decade, the future of these historic docks was clear due to their inability to support the rapidly increasing containerisation of goods passing through the docks. Development of docks at Tilbury, Southampton and Felixstowe were the future. The area covered by the docks, the industries clustered around the docks, and the housing of those who lived and worked in East London was significant, running from Tower Bridge to Beckton where the River Roding entered the Thames. The Conservative Secretary of State, Peter Walker was clear in his views that the task of development was outside the scope of local government, and as a result a firm of consultants, Travers Morgan were hired to investigate the possibilities for a comprehensive redevelopment of the area. 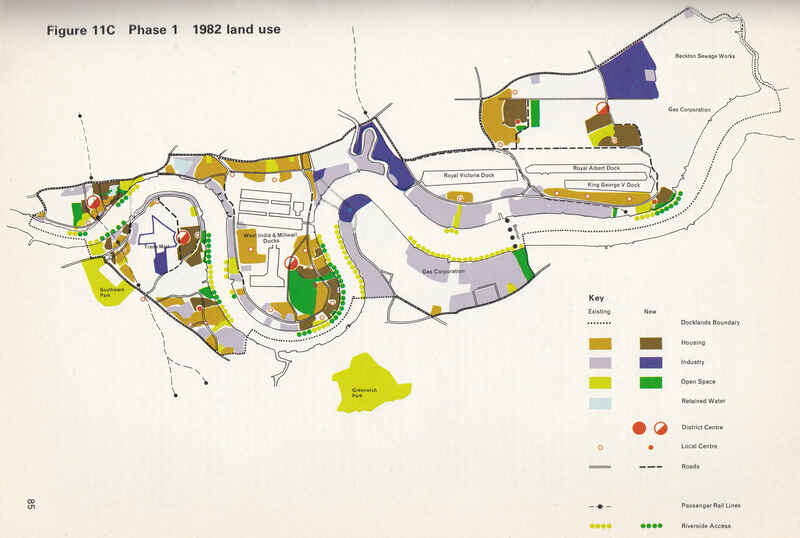 The proposals put forward by Travers Morgan in their 1973 report proposed a number of possible development scenarios which included office development, housing and even a water park, however their proposals had minimal input from those who still lived and worked in the London Docklands. The Travers Morgan report was opposed by the Trades Unions and local Labour authorities and the Joint Docklands Action Group was setup to coordinate opposition. Labour took control of the Greater London Council (GLC) in 1973, and in the 1974 General Election, Labour formed a minority government. The Travers Morgan proposals were abandoned. The committee was comprised of representatives from the GLC and the London boroughs both north and south of the river that came within the overall boundaries of the docks (Newham, Tower Hamlets, Southwark, Greenwich and Lewisham). The Government also appointed representatives to the committee and community organisations were represented through the Docklands Forum who had two members on the committee. The proposals produced by the Docklands Joint Committee were very different to those of the earlier Travers Morgan study. Travers Morgan had identified a future need for office space, along with housing and retail, however the proposals of the Docklands Joint Committee focused on what the existing inhabitants required and how their skills could best be used and therefore developed a future based on manufacturing and industry. The Strategic Plan as a draft for public consultation was published in March 1976 with a request that comments should be sent by the 30th June 1976. The plan was very comprehensive including the routing of roads, public transport, industry and housing. Four maps within the plan provided a summary of the Docklands Joint Committee’s recommendations for how land use across the docklands would transform over the coming years. The first phase of docklands development would start to expand established district centres and new housing would be built in Wapping, around the Surrey Docks/Deptford area (expanding the existing Redriff estate) and new housing in the south-east quarter of the Isle of Dogs. The development of large industrial zones would commence, centred on the Greenwich Peninsula and along the river to Woolwich, the areas around the River Lea and Beckton. For transport, short-term improvements would be made to the North Woolwich and East London line along with improvements to bus services and existing roads. The second phase of docklands development continues the work of the first phase with expansion of housing in Wapping and the Isle of Dogs, with substantial new housing in Beckton. The plan proposed that by the end of phase 2 development across the Surrey Docks would be complete. In the map below, the River line is shown as a line of wide and narrow dashes out to just north of the Royal Victoria Dock. Other diagrams in the report show the two options for extending the route on to Thamesmead, one via Beckton and the other option via Woolwich Arsenal. 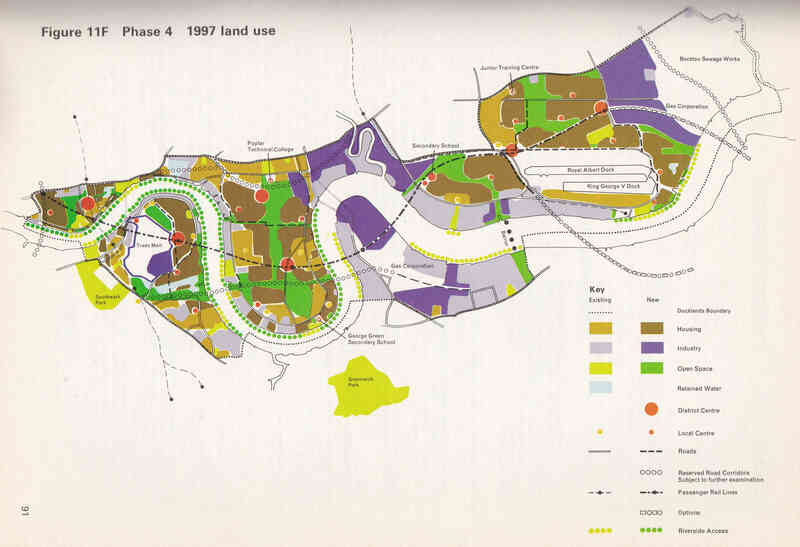 Phase 3 up to 1990 is where the major changes were implemented and would have resulted in a very different docklands to the area we see today. Phase 3 included the filling in of the majority of the old docks, with the exception of the Royal Albert and King George V docks. The report does acknowledge that the ability to make these changes is very dependent on the future operations of the Port of London Authority on the Isle of Dogs and the Victoria Dock in Newham. This highlighted one of the key challenges for the Docklands Joint Committee in that they did not own any of the land across the docklands so the implementation of their proposals would be very dependent on large owners such as the Port of London Authority and the availability of significant funding. Phase 3 would see the work in Beckton complete with new housing east of the district centre. In Silvertown and North Woolwich the release of land around the Victoria Dock would allow the extension of the Poplar and Silvertown industrial zones to the east. For transport, phase 3 identified the possible route of a new road, the southern relief route (shown by the line of circles in the diagram below). The route shown would have involved two river crossings, complication by the need for opening bridges. The benefit of the route across the Isle of Dogs was, although dependent on the future of the Millwall Dock, it would pass mostly through vacant land. A disadvantage of the route was identified as the significant additional traffic the new road would feed into Tooley Street and the resulting addition to the congestion on the approach to Tower Bridge. Phase 4 completed the development across the docklands, however still with options for train and road routes. 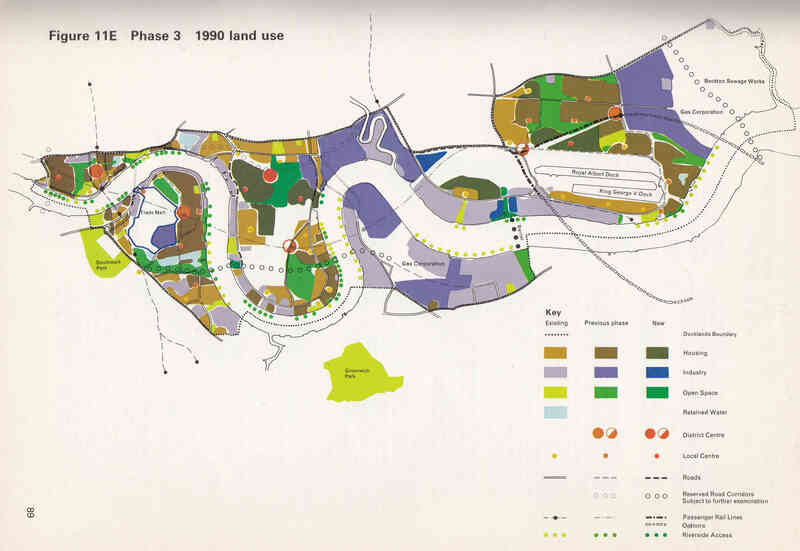 In the Isle of Dogs, there would be further additional housing, however the main feature is continuous open space from the north, through the centre of the peninsula, to link up with Mudchute in the south. 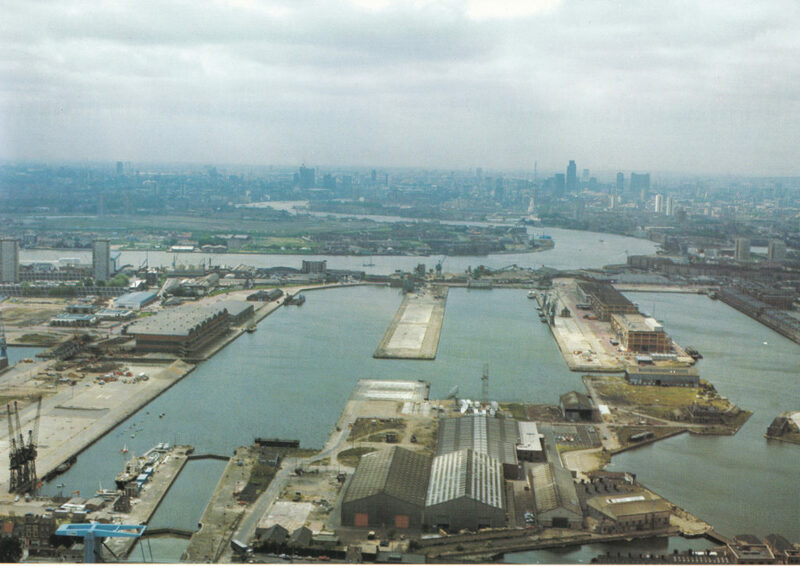 In the Silvertown and North Woolwich area, there would be additional housing and open space to occupy the area once covered by the Royal Victoria Dock. The map shows the route reserved for the proposed road, and the two options for extension of the proposed River line on to Thamesmead. 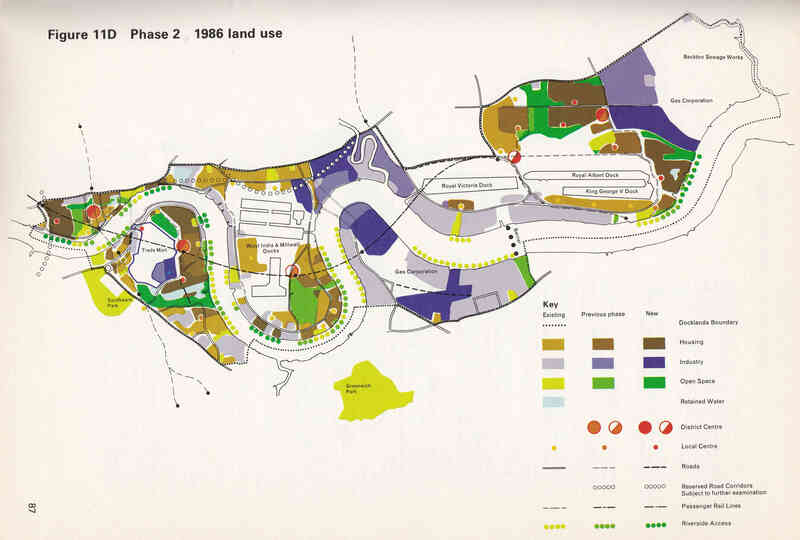 The map for phase 4 shows how different the docklands would have been if the proposals of the Docklands Joint Committee had been implemented. The remaining 1,100 acres was assumed to be still held by the Port of London Authority (the Royal Albert and King George Docks), the Gas Corporation at Greenwich and Beckton and the Thames Water Authority, also at Beckton. Although the report documented the considerable redevelopment of the whole Docklands area, the report also identified as a priority the need to retain many of the older buildings that could still be found across the area. 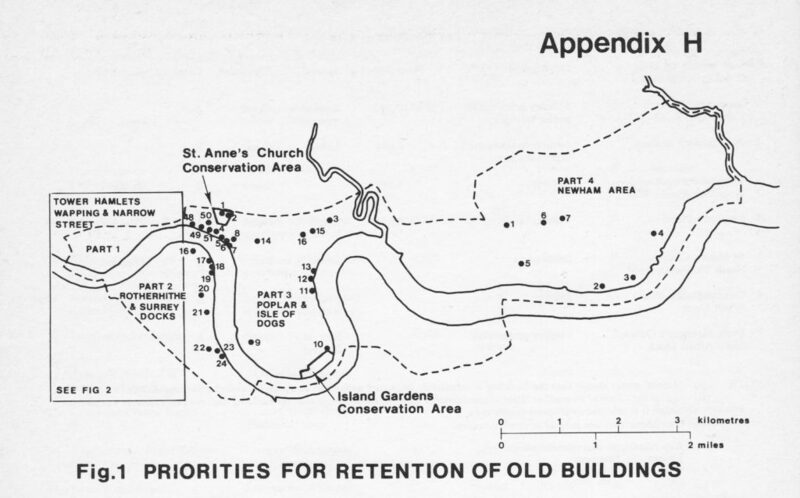 An appendix of the report listed 101 buildings that were a priority for retention. 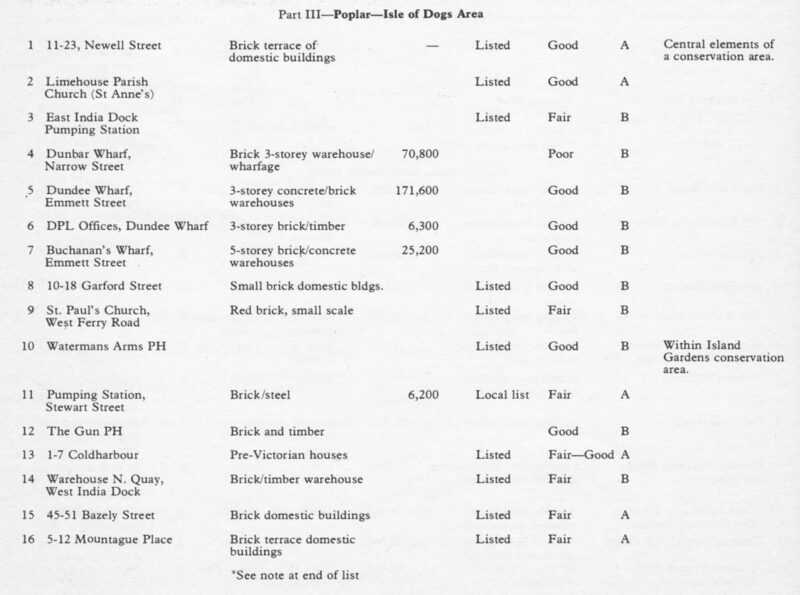 An extract from the appendix is shown below with one of the maps, and following a list of the buildings in the Poplar and Isle of Dogs area. The number in the third column is the floor space, not a financial value. The need in the report to list buildings that should be retained is similar to the 1973 Architects’ Journal on East London which also listed buildings across East London that were at risk. There was considerable concern that wholesale development of such a large area of land would include the destruction of many of the historic buildings that could be found across East London. Many of these had lost their original function which placed them at further risk. Following publication, a number of problems were quickly identified with the proposals. The emphasis on industrial and manufacturing space rather than office space did not align with the wider environment across the country with the gradual decline in manufacturing and the potential growth in financial services and wider service industries that was taking hold in London. The Docklands Joint Committee had no real powers and no direct access to finance for the purchase of land and the implementation of the proposals. This was further complicated by the lack of local authority finance due to the economic conditions of the mid to late 1970s. The Docklands Joint Committee was also intended to coordinate the response of the individual local authorities that covered the docklands, however all too often these local authorities acted in their own interest. Examples being the work of Tower Hamlets to relocate Billingsgate Market and to bring the News International print works to Wapping in the early 1980s. The Docklands Joint Committee did try to bring in private finance late in the process, however this was opposed by some of the local action groups who did not agree to the use of private finance in the development of the area. In the meantime, the people of the Docklands were getting more and more frustrated with the lack of action, endless studies and consultations, but no significant development. Jobs and people continued to leave the Docklands. When the Docklands Joint Committee report was published in 1976 the population of the Docklands was round 55,000 and by 1981 this had reduced to 39,000. The House of Commons expenditure committee examined the work of the Docklands Joint Committee in 1979 and came to the conclusion that since the committee had been formed, very little had been done. 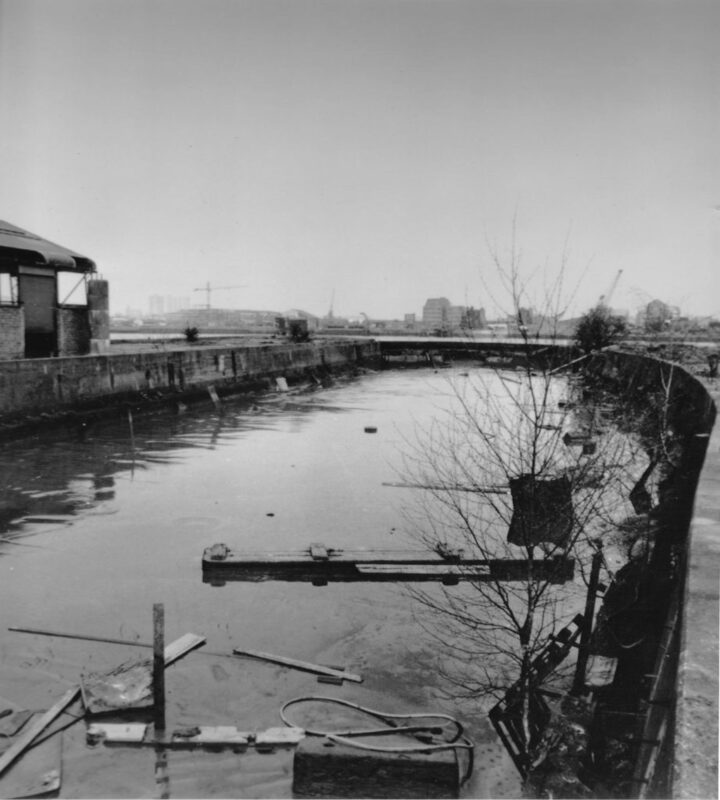 As well as coming in front of the House of Commons Expenditure Committee, 1979 was also the year of another event that would seal the fate of both the Docklands Joint Committee and their proposals when a Conservative Government was elected. Michael Heseltine as the Secretary of State for the Environment created Urban Development Corporations, one of which would focus on the London Docklands as the London Docklands Development Corporation. The Conservative ideology was also that private rather than public money would fund and drive much of the development of the Docklands. Financial deregulation would also drive the demand for a new type of office space consisting of large open floor trading areas with the space to install the complex IT systems and their associated cabling that was a challenge in the more traditional buildings of the City of London. The Docklands area today continues to develop. 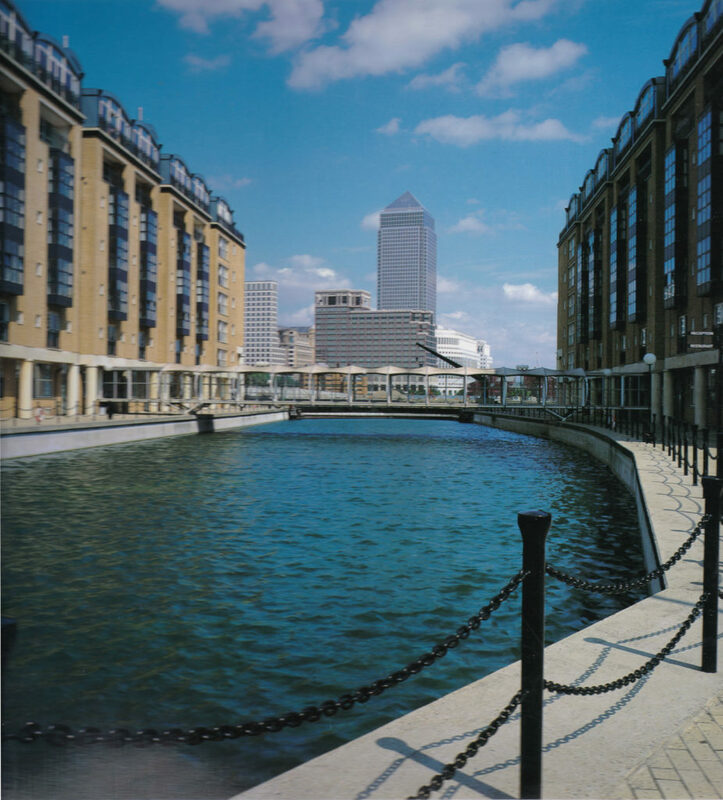 The Isle of Dogs seems to be a continual building site, however it could have all been very different if the proposals of the Docklands Joint Committee were not now just an interesting footnote in the development of London. This entry was posted in London History and tagged Docklands Joint Committee, Isle of Dogs, LDDC, London Docklands Development Corporation, Poplar on February 18, 2018 by admin.